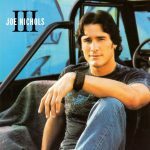 III is the fourth studio album from country music artist Joe Nichols, released in 2005. The album’s name is the Roman numeral three. The title refers to it being his third album to be released on Universal South Records. The album produced Nichols’ second #1 hit in “Tequila Makes Her Clothes Fall Off”, as well as the top-10 hit “Size Matters (Someday)” and “I’ll Wait for You”. Overall, it was certified gold by the RIAA for sales of well over 500,000 copies. “My Old Friend the Blues” is a cover of a Steve Earle song. Also included is “Should I Come Home (Or Should I Go Crazy)”, a cover of a Gene Watson hit single. Brent Rowan produced the album except for the three singles, which were produced by Buddy Cannon, and “Freedom Feels Like Lonely” and “As Country as She Gets”, which were produced by Byron Gallimore.